Do you ever wish someone would show you how to engage clients who don’t respond? Maybe you’ve tried everything you can think of and still nothing. At this point, have you written the client off completely or are you still actively pursuing them? People who’ve followed my work for a while know I’m not a fan of chasing clients. I even wrote an article about it awhile back called, Why Chasing Clients Doesn’t Work. However, there’s a difference between chasing someone and staying engaged with someone. Recently, a client in the Sticky Selling Mastery Academy posed a question during one of our group coaching calls about what best next steps are when a prospect stops responding. In her case, the prospect had engaged with her quite a bit and did show some interest in working with her. However, my client missed an important step early on in the relationship. She didn’t make it easy for the prospect to take the next step. Maybe you’ve been in a similar situation or maybe you’re in this very same situation now. You get a little engagement with someone and then you ask them if they’d like to hop on a quick phone call and they stop responding altogether. This is where most people get frustrated and spend time and energy wondering when and how often to follow back up with the prospect. When I say my client missed the step of making it easy for the prospect to get on the phone, what I mean is she didn’t give the prospect a few possible times to talk. She left the ball in the court of the prospect. This rarely works. Your clients are just as busy as you are and they won’t take the time to tell you when they’re available. During our coaching call, I gave my client specific language to use going forward to increase her chances of getting clients on the phone. This is the same language I use in my client interactions and it works more often than not. My brilliant client who’s struggling to overcome her reluctance around selling and not coming across as salesy decided to take action. Was she nervous about contacting the prospect again? Absolutely, she was terrified. Yet, that didn’t stop her. The next action she took was so exceptional and thoughtful, its something many people never think to do. She actually decided to put the relationship before the sale. She did a little research by looking at the prospects social media posts. Through her actions, she was able to discover what had been happening in this person’s life recently. She then sent a thoughtful message wishing the prospect well and shared some tips that may support the person in what they had going on. Notice, she didn’t beg for this person’s time and she didn’t try to sell this person. She instead focused on building rapport. The result of her actions was the prospect actually responded. She thanked my client for the tips and then she let my client know she was still interested in doing business with her. My client was then able to implement the strategy of giving her a few possible times to meet using the language we’d gone over. They scheduled a time to meet, had a great conversation and my client closed the deal. Here’s where my client went so very right and where you can as well with your clients, she was engaging. She wasn’t selling, she didn’t make the interaction about her wants and needs, she made it about the prospect. It was personal and it was relevant to the prospect. She put the relationship before the sale and the result was she closed the deal. Yes, it took her a little more effort and it was worth it. This is a huge opportunity for my client. Please note, my client did still want to earn the business. She invested time and money to learn the skills she needed to move to the next step. It wasn’t a case of just “winging it” and hope for the best. She took action and was ready to invite the prospect to the next step at the appropriate time. The situation didn’t need to be forced, she just needed to know what to do when the opportunity arose. What would happen this week if you took the time to engage with people you’d like to do business with by building rapport and relationships? Would you then put yourself in the position to earn the person’s business when they’re ready to buy? Your chances will increase significantly vs. always approaching them when you’re in “selling” mode. 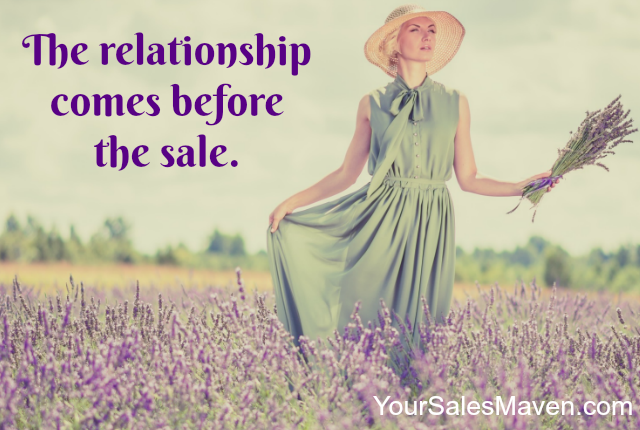 Maybe it’s time for you to invest in learning the art and skill of relationship selling. You’re welcome to reach out and set up a time to chat about ways we might work together to hone your skills.